Taking a swipe at his political opponents, ailing Goa Chief Minister Manohar Parrikar Wednesday said he was high in 'spirit' and fully in his senses. 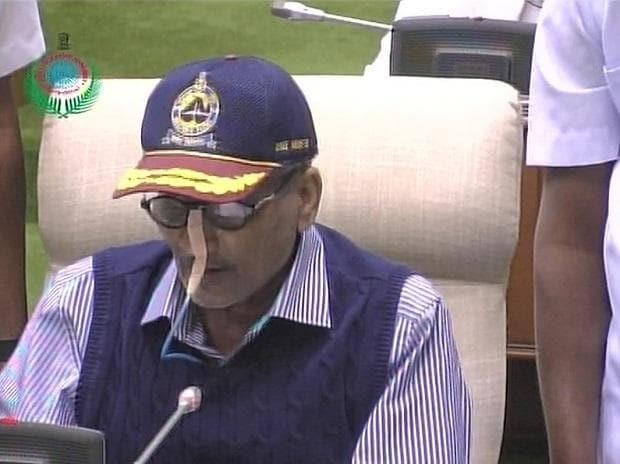 Parrikar, who is suffering from pancreatic ailment, presented a revenue surplus state budget sitting on his chair in the state Assembly, with a tube inserted through his nose. His remarks came days after the opposition Congress said that while the BJP-led Goa administration has "collapsed" and the state's debt is mounting, the chief minister was asking about the "josh" among people in the state. "Pehle hosh me aao, baad me josh ki baat karo (first come to your senses and then talk about josh)," Goa Pradesh Congress Committee president Girish Chodankar had said Monday. Taking on his opponents who had taken potshots at his remark, Parrikar on Wednesday said, "I am presenting the budget in josh. The josh that is too high, very high, and fully in hosh". While presenting the budget, Parrikar began his speech saying, "I bow before my motherland, Goa and Goemkarponn (Goanness)," and thanked people for their "continuous blessings" to him. "I will continue to serve the state till my last breath," he said. Parrikar then tabled the budget which has total gross budgetary expenditure, including power purchase of Rs 19,548.69 crore as against Rs 17,123.98 crore for 2018-19, an increase of 14.16 per cent over last year. "Overall, for the year 2019-20, the annual financial statement indicates a revenue surplus since many years in succession. The revenue surplus is estimated at Rs 455.10 crore," he said. As Parrikar's voice weakened while reading out the budget, Speaker Pramod Sawant intervened and said copies of the speech would be circulated among the House members. The total estimated expenditure on revenue account is Rs 13,308.26 crore, while the expenditure on capital account is Rs 4,987.45 crore, Parrikar said in his speech. "There is an increase in the allocation for capital account expenditure by 18.29 per cent as compared to the budget estimate for last year, which was Rs 4,216.25 crore," he said. He said with the budget, the government has continued to lay stress on agriculture, education, health, information technology, employment, infrastructure and overall sustainable economic development of the state.